Another detail from the herb garden at Grassmere historic farm. 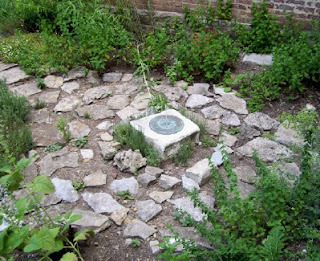 Here, the gardeners have used scrap limestone to make a pleasing paved circle. Many stone yards have a pile of leftover stones and rubble, free for the asking! The Tennessean's Ms. Cheap has always recommended the free pile at Jones Stone off 8th Avenue.